Cleaning many chemical drums thoroughly can be a lengthy and arduous task, physically taxing and fraught with risk. There are systems such as the ‘sucker flusher’ where probes are used to both extract chemical and rinse the container, or pressure rinsing, where an induction hopper is built in equipment. In addition there is the piercing nozzle which is used to penetrate the drum and with dexterity, flush the drum from the inside. These systems will often require 15 litres of water per 20L drum and in the process create a large volume of contaminated waste water for environmentally safe disposal. The TripleRinser has met all these challenges, making it easy for the worker to use the unit as an induction system if desired with the venturi fitted model and keeping all chemical container handling low and in the splash confines of the high sided tub. A gentle hand pressure on the base of the drum is all that is required of the worker to effectively flush out the chemical and the rinsate can be captured safely and utilised in the required process or to a bunding area or tank for responsible recycling. TripleRinser accessories, the piercing bar and stainless steel drain tray, assists in ensuring the triple rinse process achieves the desired standards of drumMUSTER by proper draining and holing the container for recycling. Sub-standard cleaning creates hazards all along the recycling chain, where costly residual chemical is being wasted by the user and without proper drainage and drying, puts the health of people and the environment at risk. Many community groups, schools etc, who act as collection agents for drumMUSTER may be at risk of chemical poisoning when handling poorly cleaned containers of toxic chemicals. Recycling transfer stations crush and bale plastic drums, which results in toxic chemical seepage in the environments of the workplace, the transport operator and the route to the recycling company. 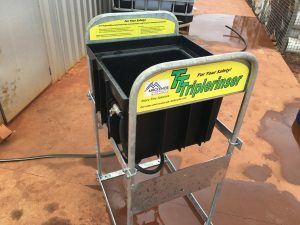 With the TripleRinser, when you have finished rinsing, the piercing bar will easily puncture the drum base and the drain tray ensures residues will drain into the tub. With the handy mounted hose and nozzle at the side, all areas can be rinsed clean and that waste collected or used also. See the drumMUSTER standards page.